GLSEN 2008 holds annual homosexual youth conference in Boston. Shows the horrors of what's going on in your schools! Held at a high school in Boston. 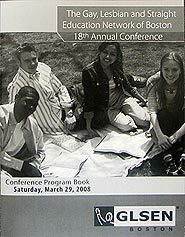 On Saturday, March 29, 2008 the Gay Lesbian, Straight Education Network (GLSEN) held its regional conference at English High School in Boston. GLSEN uses taxpayer money to run "gay-straignt alliance" clubs, the "Day of Silence", and other homosexual activities in schools across the state. The conference is serves as the starting point for its activism over the coming year. Here's what they're doing. It's every parent's nightmare.